In true entrepreneurial spirit, it began with a dream and a little capital. 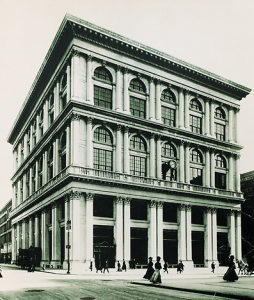 Tiffany & Co began as a stationery and fancy goods store in 1837 and grew into a global icon. Started in New York by 25-year old Charles Lewis Tiffany and John B. Young with a $1,000 dollar advance from Tiffany’s father. Discovering an emerging American style contrary to the Victorian era opulence of the time, Tiffany discovered a style, emerging in America that took inspiration from the natural world in simple patterns that displayed harmony and clarity. First recognized at the Paris World Fair in 1867, Tiffany was awarded a grand prize for silversmith craftsmanship, and was the first American company to do so in Europe. The Tiffany standard for silver became the adopted standard by the U.S. Government. Evolving their studio into a school for design that encouraged apprentices to seek inspiration in nature and explore the artwork of studio head Edward C. Moore also a renowned silversmith. By 1870 Tiffany & Co. had become the preeminent silversmith of America. By the 20th Century had over one thousand employees and branches in London, Paris and Geneva. The legacy of Tiffany’s design is shared in their distinctive catalog, the annual Blue Collection.